You mean this pod? No, I don’t think I could have built this myself. Did you build that vehicle yourself? If I'm informed correctly, Buggy is some sort of clown pirate or something and Ms. Fortune is a...cat-woman? Who are Buggy and Ms. Fortune anyway? You name it! From the frozen peaks of Carpathia and long-abandoned Soviet towns to scorching deserts and jungles. Even if the Commander orders me to fight in Hell itself, I'd absolutely do it! On what battlefield's have you fought on? I had to. If I were to have returned I wouldn't have left. You wouldn't understand. What celestial shaving cream do you use? You fiend! Why did you kill Meredith with tumor you monster!!! That headband really suits you! Have you tried any other hair accessories as well? "It's natural... My blue hair comes from my mom's side of the family..."
WHY IS YOUR HAIR BLUE?! What do you mean by “how”? Hey, if you have a moon does that count as a lodger or a hitchhiker? So do you have any powers? I've existed since the beginning of time, why do you ask? 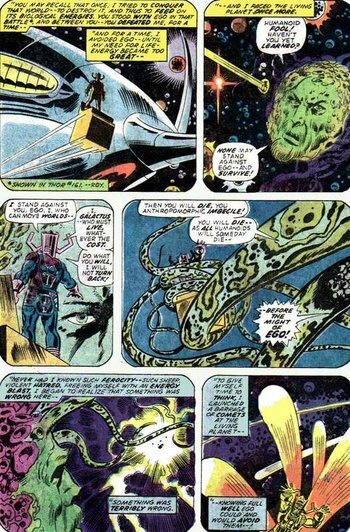 Have you ever encountered Galactus? Yes I heard and saw all about the tale of the young Miguel, I secretly cheered for him in the sidelines and was rejoiced when he saved his family, Hector. Indeed, Ernesto may not yet be in my realm, and will not for a long time, but once he does, that cabron is going to suffer for a long time, I'll make sure that happens. Ever met pony versions of those guys from the other Day of the Dead movie? I'm the leader of my small group of friends: Gallus, Silverstream, Yona, Ocellus, and Smolder. I'm the only pony among them, but we get along quite well. How does it feel, that a bunch of kids could friendship you into submission? No. I'm looking for a boy called John Connor. I just need to talk to him. Have you seen him? Are you a master of hell? Oh! Just studying with Nariyuki, Rizu and Uraka to improve my bad grades at math that's all. That’s a bit of a tricky question to answer considering that, while the organisation I’m in has no clones, the ones used for combat certainly are because, how could you explain the Cat Army deploying 1, 4 or possibly 10 of the same person if the clone possiblity is not correct? As for me specifically, no, I’m not a clone. Are you some sort of manufactured clone? In which case, what madman made you? Oh, you don't like this appearance, hold on I can change it. Have you considered getting a makeover? I feel like you could really use something for your complexion. "It's strange... Ibuki was in front of me, and I had some cards in my hand... From a card game called 'Vanguard', I think..."
"...I've never played a game like that before, but I was playing..."
"...I can't remember what I was doing there or why I was playing... Ibuki something about 'releasing me from Vanguard', I think... I don't know what he meant..."
"It feels like... like I'm forgetting something..."